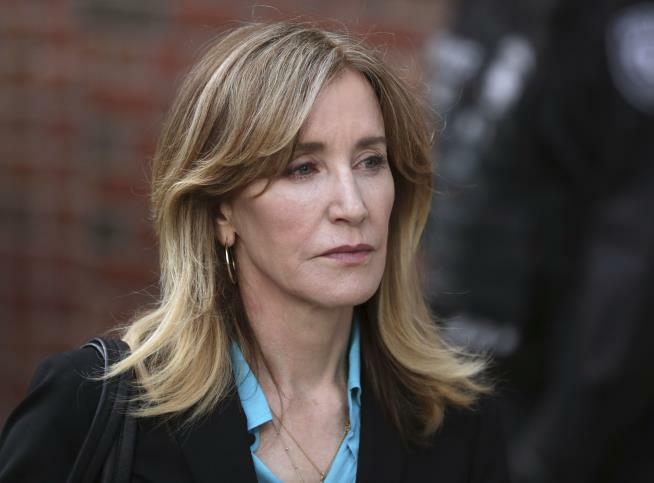 (Newser) – Actress Felicity Huffman has agreed to plead guilty in the sweeping college admissions cheating scam that has ensnared wealthy parents and athletic coaches at some of the nation's most selective universities, federal authorities said Monday. The Desperate Housewives star and 12 other prominent parents will admit to charges in the scheme, which authorities say involved rigging standardized test scores and bribing coaches at such prestigious schools as Yale and Georgetown, the AP reports. One coach has also agreed to plead guilty, per CNN. Huffman was accused of paying a consultant, Rick Singer, $15,000 disguised as a charitable donation to boost her daughter's SAT score. Authorities say the 56-year-old actress also discussed going through with the same plan for her younger daughter, but she ultimately decided not to. Michael Center, the former men's tennis coach at the University of Texas at Austin, who was accused of accepting nearly $100,000 to help a non-tennis playing applicant get admitted as a recruit. Parents Gregory and Marcia Abbott, Jane Buckingham, Gordon Caplan, Robert Flaxman, Agustin Huneeus Jr., Marjorie Klapper, Peter Jan Sartorio, Stephen Semprevivo, and Devin Sloane have agreed to plead guilty to the same charges as Huffman. California real estate developer Bruce Isackson and his wife, Davina Isackson, are pleading guilty to those same charges; plus Bruce Isackson will plead guilty to money laundering conspiracy and conspiracy to defraud the IRS for allegedly taking a tax deduction for the bribe. I'm willing to be fair here. For those who donated to Republican candidates, a modest fine, probation, and community service. For those who donated to Democrats, life without parole in solitary confinement. Don't break any laws of the country you live in if you do not wish to go to jail or prison.